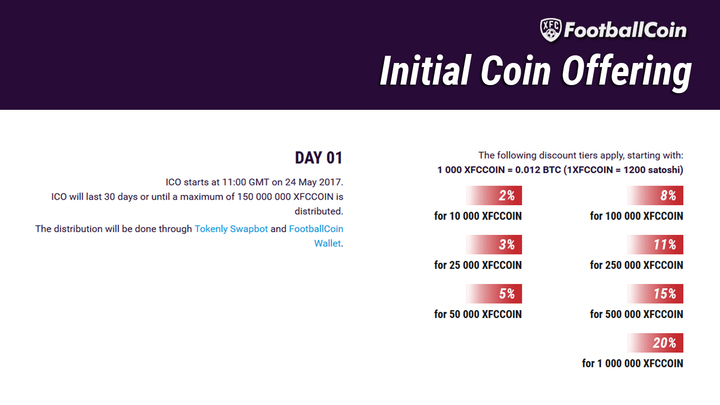 Initial Coin Offering of XFCCOIN is under way. On the 27th of May, FootballCoin will start selling full packs of ten of the biggest teams in Europe at a 50% discounted price. The day is almost here where FootballCoin fans can own cards of their favorite star players. 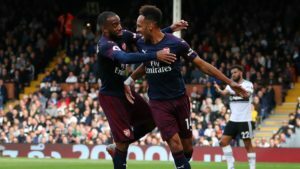 FootballCoin is continuing its round of discounts to coincide with the initial coin offering of their currency, XFCCOIN. On the 27th of May at 11:00 GMT FootballCoin will begin distribution of player cards. To mark this event, we are offering 50% discount on full packs of ten of the most important teams in Europe. From the Premier League we have: Manchester United, Chelsea, Manchester City and Arsenal. From La Liga there are Barcelona, Real Madrid and Atletico Madrid. And from Serie A we will feature discounts on the rosters of Juventus, Napoli and AS Roma. A maximum of 25 packs will be available for each team. 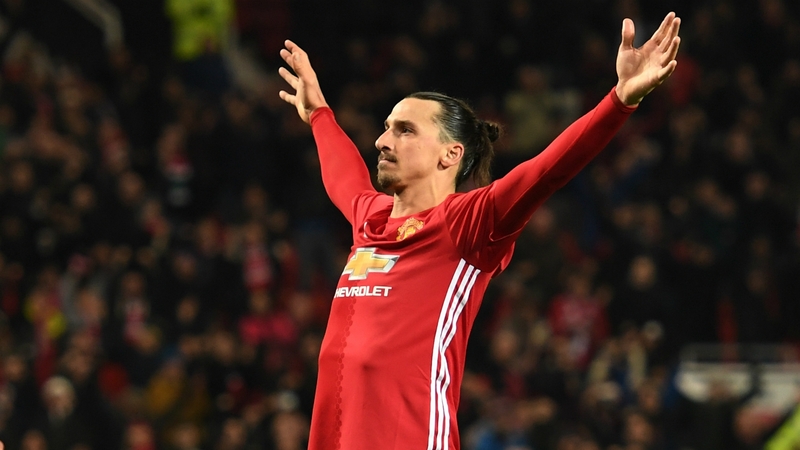 Football fans have had every reason to get excited about the Europa League final won by Manchester United against Ajax Amsterdam. In two days they will have the opportunity to own FootballCoin cards for the likes of Zlatan Ibrahimovic, Juan Mata or Marcus Rashford. Considering the 50% discount, it’s a steal, with the full price for the pack moving down to 110.750 XFCCOIN. And for Red Devils fans there will be plenty to look forward to for the next season. Jose Mourinho’s team will be highly motivated to make a bid for the Premier League and Champions League trophies. The team ended their season in England in a disappointing sixth place. However, with three trophies to their name in this season alone, there is much more to be expected of Manchester United. The entire pack will consist of 17 players, all ranked 3* or higher in the game. The squad benefits from United’s transfer strategy of including young prospects, as well as more experienced players. The roster finds a good balance between potential and tested excellence. On the one hand there are players with a great reputation. Players like Michael Carrick, one of the game’s last regista, a player excellent both as a provider of great passes and of defensive support. There is the extremely skillful Juan Mata, succesful at Valencia, Chelsea and now United. Antonio Valencia who has been with the team since 2009, winning two Premier League trophies along the way. Of course, then there is Zlatan Ibrahimovic. The striker, who has won the league title in four countries, is eager to triumph in England, as well. On the other hand there are plenty of stars on the rise. Man. Utd. has shown to be a team ready to spend huge amounts for young talent. 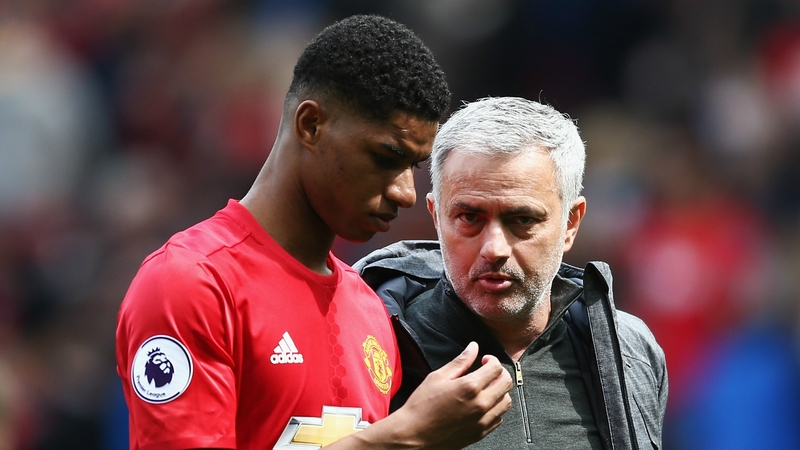 Marcus Rashford is expected by many to become one of the best strikers in the world. Anthony Martial is another player of great potential, purchased by United for an initial £36 million from Monaco. Eric Bailly is likely to become favorite for the central defender position. And of course, there is the 5* rated Paul Pogba. 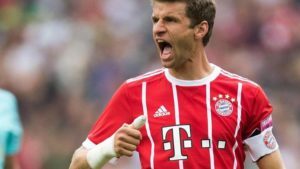 The midfielder returned to United in 2016 for an estimated €105 million, the highest fee in football. 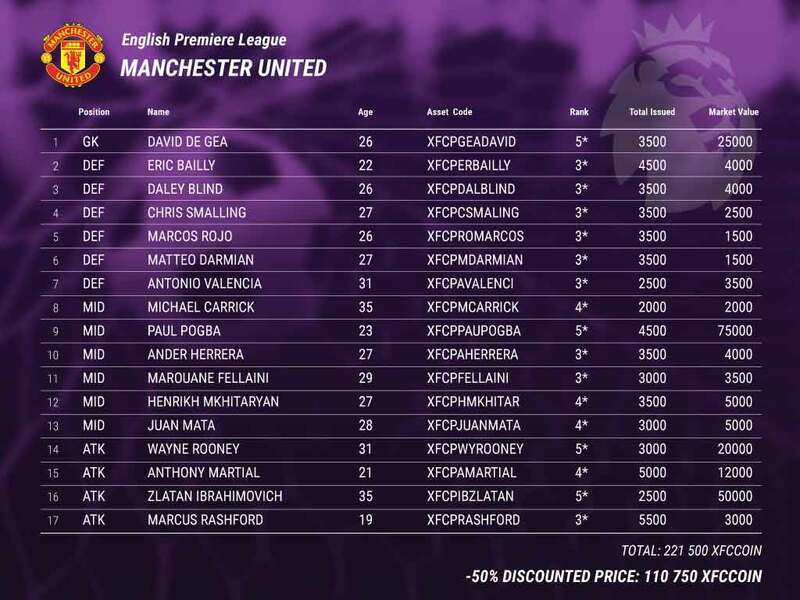 Owning any of the players in the Manchester United pack can certainly offer you a great advantage in winning FootballCoin contests. With more users joining the community, any advantage is selecting your team will become important in winning XFCCOIN.